I do a lot of cooking from scratch but I’m not adverse to using things in jars. For this recipe I wanted to create something that you could whip up reasonably quick after work. I often save prawn shells when I’m cooking to make this simple prawn stock and freeze it so it’s ready to use when I need it. 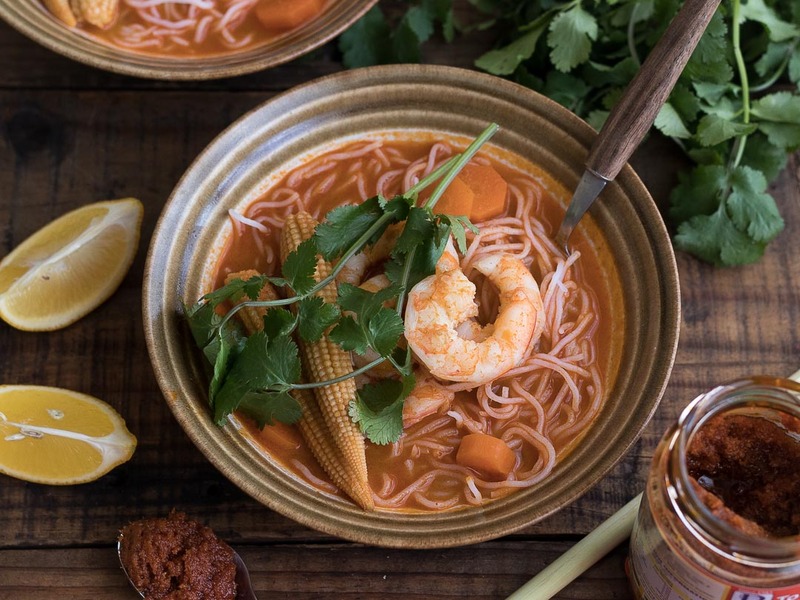 Find a good quality Tom Yum paste and what you’ll be doing with this recipe is jazzing it up and giving it some freshness. You can add any vegetables to this dish to bulk it up more. Peel the prawns and set aside the shells and prawn heads. Devein the prawns and set aside. Heat the rice brain oil in a small saucepan and sautee the shells and prawn heads till they change colour and become slightly golden. Add water to the pot and bring it to a gentle boil before simmering shells for 30 minutes. Prepare the vermicelli as per the packet, usually I place the vermicelli in a bowl and pour boiling water over the top and then cover it with the lid for 15-20 minutes till the noodles are softened and then I drain them. Strain the prawn stock into another saucepan and bring back to a gentle boil – cook the prawns in the stock till they just change colour and then set aside. Add the tom yum paste to the prawn stock and have a taste to see if there’s enough flavour, if not add more paste. Add the carrots and simmer the soup till the carrots start to soften before adding the baby corn. Once the baby corn is warmed through, taste the soup and add extra fish sauce and lemon juice to balance out the salty and sour flavour. Divide the vermicelli and prawns between two bowls and ladle the tom yum soup over the noodles. Scatter with coriander leaves before serving.